A bit more research on Rehman “Ray” Jinnah reveals that he was chair of the Pakistani American Link Committee, and they have a few friends in congress besides Hillary Clinton and Nancy Pelosi. Rehman returned to America to face his indictment for illegal campaign contributions a few weeks back, and interestingly enough, not a peep’s been heard in the press since. Here’s the Sourcewatch details of the known contributions, and a snip from a past article. In his welcoming remarks, the host, Rehman Jinnah praised the First Family. He said Hillary Clinton is not an ordinary individual. Rather than rest on what she has already done, Hillary Clinton is looking for a new challenge, Jinnah added. 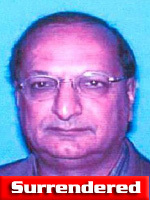 Rehman Jinnah is a Southern California-based businessman, who has hosted receptions for Vice President Al Gore and other high officials. He is Vice Chairman of the Democratic National Committee (DNC) and Co-Chair of America Millennium. 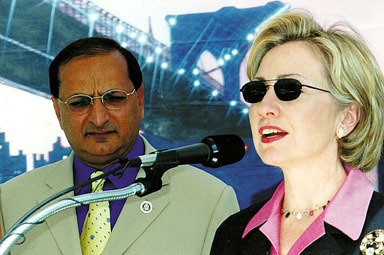 Here at Pakistan Link, you can see that Congressman Berman, a Democrat from the 28th District of California, is also a friend, and here you can see Rehman and Hillary together as she speaks at a gathering. Here’s the FBI wanted poster for Rehman. By 2004, Jinnah had cemented his party ties. He and his family, who had moved to Bel-Air, personally contributed $122,000 to Democratic candidates and causes that year alone. Jinnah also joined the Pakistani American Leadership Center formed in 2004 to build the community’s clout, chairing a committee to grow membership in a brand-new Congressional Pakistan Caucus. By 2006, it claimed 71 members of Congress. Some center members worried about Jinnah’s partisan Democratic politics and taste for self-aggrandizement. Here’s the oldest article on the topic I could find at Free Republic. For the full sordid details of Rehman Jinnah’s campaign financing (Clinton, Kerry, Pelosi…) bankruptcies, opulent lifestyle, and questionable business ventures see this article. In 2000, Jinnah told friends he had become a vice chairman of the Democratic National Committee, though DNC officials now say they have no record of it. When the Democratic convention came to Los Angeles that August, Jinnah hobnobbed with the party’s elite. He recruited host committee chief operating officer Cheryl Carter, a former Clinton White House aide, and Naz Nageer, the convention’s technology director, to join him in a start-up technology venture. Carter, who took a $500,000-a-year job as president, said that she met Jinnah through mutual friends and that her hiring was unrelated to her political work. Nageer refused to comment. Both sued Jinnah for breach of contract when the start-up folded after a few months. Nageer won a judgment, but never collected, court records show. Carter dropped her suit. Soon after the convention, Jinnah visited the White House and had his photo taken with the president, a testament to his growing influence. The same month, he held his first event for the then-first lady during her inaugural Senate campaign: Thai restaurateur Tommy Tang catered, and the candidate posed in Jinnah’s Northridge yard beside a mini-Statue of Liberty. Jinnah used his Clinton ties as a self-marketing tool. In his office and home, he displayed numerous photos of himself with the couple. He saved voicemails from Hillary Clinton and played them back for acquaintances. But I was wondering if there had been a list that came out the other day of the major contributors to CAIR. The article had come out about how CAIR’s base had eroded by thousands of members and there was a promise of more information and identifications to come – I was on the edge of my seat to see who had been pumping money into CAIR but it’s like the story disappeared! Not yet, at the sourcewatch link in the story above you can see who they contribute to however. There’s also the Padilla case as well, lots of audio tapes there that the press is trying to get released under the freedom of information act. But check this out Thanos. Very interesting, but also interesting that the point they want to control is the border. What’s scheduled to come in?